Heidarizadi, A., Taherpour, K., Mousavi, S., Rostami, F., Ranjbar, K. (2014). Effect of Borage Powder on Blood Cells and Immune System. International Journal of Advanced Biological and Biomedical Research, 2(4), 900-903. Abedin Heidarizadi; Kamran Taherpour; Seyyed Gholamreza Mousavi; Farhad Rostami; Karim Ranjbar. "Effect of Borage Powder on Blood Cells and Immune System". 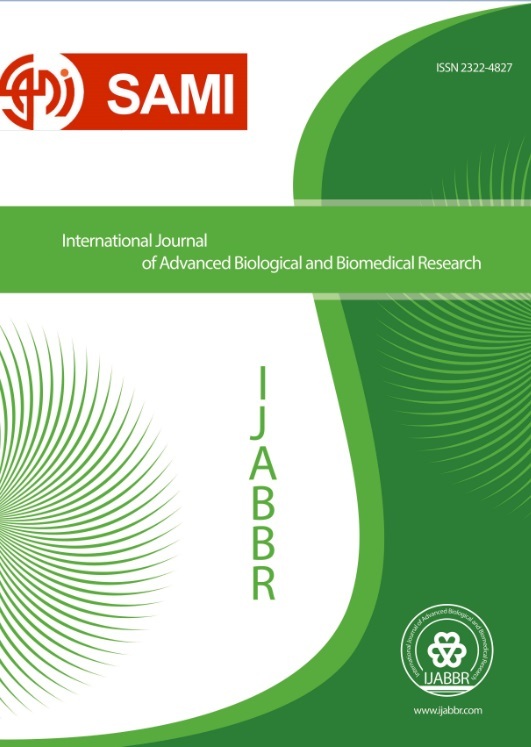 International Journal of Advanced Biological and Biomedical Research, 2, 4, 2014, 900-903. Heidarizadi, A., Taherpour, K., Mousavi, S., Rostami, F., Ranjbar, K. (2014). 'Effect of Borage Powder on Blood Cells and Immune System', International Journal of Advanced Biological and Biomedical Research, 2(4), pp. 900-903. Heidarizadi, A., Taherpour, K., Mousavi, S., Rostami, F., Ranjbar, K. Effect of Borage Powder on Blood Cells and Immune System. International Journal of Advanced Biological and Biomedical Research, 2014; 2(4): 900-903. This study was conducted to compare the effects of diets Borage Powder and control (no additives diets) on broiler’s average blood cell counts and immune system on the broiler chicks. Sixty four male broiler chicks (Ross 308) randomly allocated into one of two treatments with four replicates of eight chickens based on a completely randomized block design. Diets were include control (no additives diets) and BP1 (5 g/kg Borage Powder) BP2 (7.5 g/kg Borage Powder). Results have been shown that number of Wight blood cell (WBC) affected by BP1 and BP2 diets as those increase number of WBC. These results showed that addition of borage powder to the broiler diet improved Immune System. Abaza I.M., Shehata M.A., Shoieb M.S. and Hassan I.I. 2008. Evaluation of some natural feed additive in growing chicks diets. International Journal of Poultry Science, 7(9): 872-879. American Botanical Council. 2000. Herbal medicine. Expanded Commission E. Monographs-Software. Integ Medic Com., Inc.
Chen H.L., Li D.F., Chang B.Y., Gong L.M., Dai J.G. and Yi. G.F. 2003. Effects of Chinese herbal polysaccharides on the immunity and growth performance of young broiler. Poultry Science, 82:364-370. Kast R.E. 2004. Borage oil reduction of rheumatoid arthritis activity may be mediated by increased cAMP that suppresses tumor necrosis factor-alpha. International immunopharmacology. 1 (12), 2197-2199. Koenen M.E., Kramer J., Van Der Hulst R., Heres L., Jeurissen S.H.M. and Boersma W.J.A. 2004. Immuno modulation by probiotic lactobacilli in layer- and meat-type chickens. Brit. Poultry Science, 45: 355-366. Liu X.Y. 1999. Stress and Immunity. Pages 230–252 in Poultry Immunology. T. B. Yin, ed. China Agriculture Press, Beijing, Chin. NRC. 1994. Nutrient requirement of poultry. National Academy Press, Washington, DC. SAS Institute. 1999. SAS/STAT User’s Guide: Statistics. version 8.01 Edition. SAS. Inst. Inc. Cary, North Carolina.